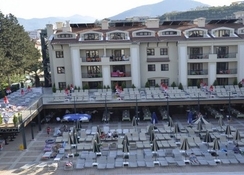 Club Alize Select Marmaris is located 800 m from the beach, with the bustling centre of Marmaris a short drive away. The resort’s outdoor pool, with fun slides and a separate section for kids, is a big draw for families. You can soak up all the action here, while digging into a sumptuous buffet from the main restaurant that serves traditional Turkish and international cuisine. If you want to take in the sights of the city, there is an elegant marina where you can spend time. Walk five minutes to find loads of restaurants and karaoke bars, filled with a lively crowd. Lie back on sunny sands on the beach, sip cocktails or go shopping, there’s always something to keep you occupied on the Turquoise coast, whatever your mood. The apartments come with kitchenettes so you can whip up your family favourites or order in from the British-themed pub, if you prefer. You can look forward to live entertainment in the evenings. Club Alize Select Marmaris, in the Turkish resort of Marmaris, lies walking distance from the beach and within a short driving distance from the city centre. 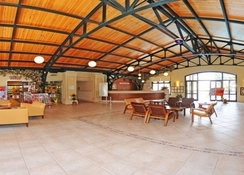 It’s located 96 km from Dalaman Airport. You can choose to stay in A1 apartments that can accommodate two people or larger families, with a living area that has sofa-beds, besides a separate bedroom. For four people or bigger families, you can pick A2 apartments that feature two bedrooms, besides a living area. Both apartments come with kitchenettes, refrigerators, hotplates, etc. They also feature spacious balconies. 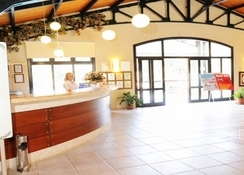 There are regular hotel rooms available as well, offering Double Beds or Two Single Beds. The rooms number 146, spread across two blocks. Club Alize Select Marmaris offers an open buffet restaurant that’s right by the pool, serving Turkish treats and international cuisine that includes British favourites. 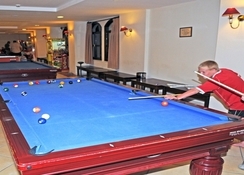 There’s a British-style pub too, with pool tables for you to enjoy a game. At the pool bar, you can order drinks, along with burgers and pizzas. The hotel’s huge pool, where kids can spend hours on the waterslides, is extremely popular. There’s also a mushroom fountain in the kids’ section. You can also relax under the parasol by the pool or grab a spot on the sun terrace. There are two separate pools for kids, where they can try out water polo and darts. The beach is barely a five-minute walk from the hotel, which is also located less than 2 km from bars and restaurants in lively Marmaris. In the evenings, you can look forward to live shows, bingo and a mini disco. To de-stress, book a session at the salon or soak in a Turkish bath.